Sophia Giambelli has never worried about competition. For three generations, the Giambelli wines have been renowned for their quality - from Napa Valley to Italy, and throughout the world. The pride of the Giambelli family and a top PR executive, Sophia loves her job - and excels at it. But things are about to change at Villa Giambelli. Tereza, the matriarch, has announced a merger with the MacMillan family's winery - and Sophia will be assuming a new role. As a savvy businesswoman, she knows she must be prepared for anything...but she isn't prepared for Tyler MacMillan. They've been ordered to work together very closely, to facilitate the merger. Sophia must teach Tyler the finer points of marketing - and Ty, in turn, shows her how to get down and dirty, to use the sun, rain, and earth to coax the sweetest grapes from the vineyard. As they toil together, both in and out of the fields, Sophia is torn between a powerful attraction and a professional rivalry. At the end of the season, the course of the company's future - and the legacy of the villa - may take an entirely new direction. And when acts of sabotage threaten both the family business and the family itself, Sophia's quest will be not only for dominance, but also for survival. I have recently become a really big fan of Roberts! I love how she can tell a story with such great character development that you can relate to them all. This book however wasn't my favorite though. I didn't care much for Sophia's character and the interactions between her and Ty. The beginning had me almost stop a few times. I found it somewhat overwhelming with so many characters & their back stories. I got Donato and Tony mixed up as they were both cheating husband's and I found it hard to follow & keep straight who was who. However once it got a bit further into the story it got better and was easy to follow. I wasn't overly impressed with the narrator. I just found her somewhat irritating at times. I think it was how she pronounced things in "Italian" I found annoying and not natural. 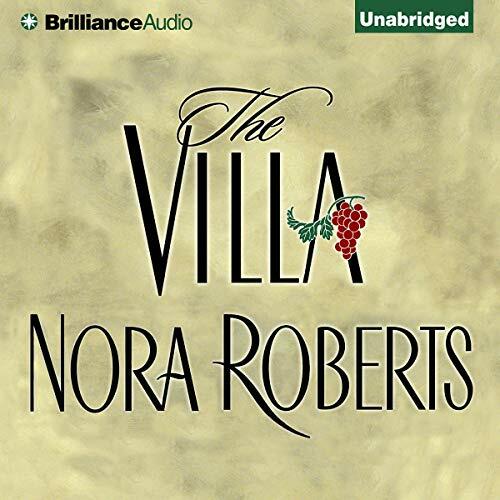 I'm a big fan of Nora Roberts and have actually read this book several years ago. The story is great several different subplots that all come together well in the end. This is a don't miss if you love romance. The narrator does an excellent job and it was a pleasure to listen. I have to say I was alittle unsure about this book at first, but OMG i loved, loved, loved it! Wish this was a series. I haven't read much Nora Roberts but of the ones I have read this is my favorite. Unlike many of her books it is a standalone and I found it very enjoyable. I wish she had made it into a series so I could read more about the characters. Definitely not in the category of classic literature but an entertaining romance. Quite good, but unlikely ending. I thoroughly enjoyed 99% of this book. The narration was excellent, couldn't have been better. The characters in the story are well developed; in my opinion, the characters and the narration, not the story itself, are what make this listen very worthwhile. However, the end was quite disappointing, and, I think, not very plausible. Still, I recommend it. I did enjoy the book but the start of the 2nd part felt as if it had been added to make up pages - it just didn't want to go anywhere in a hurry. An amazing twist towards the end that gets things going again. The characters are real and you can feel for them. I would absolutely recommend this book. It is a delightful tale of family, intrigue, romance (of course), wine, and has an unexpected twist at the end. It had all of the elements of the best Nora Roberts books: strong family relationships, an interesting story line, and a bonus two romances instead of one. The insights into wine making in California and in Italy were interesting. The characters were real - I especially enjoyed the teenage girl. Have you listened to any of Laural Merlington’s other performances before? How does this one compare? I have not listened to any other stories narrated by Laural Merlington but to my non-Italian ear, she did a fabulous job. I was much too tempted to listen to it in one sitting - and did stay up too late one evening to listen to the end of it. It is an audiobook that I will listen to several times again, I am sure. Excellent book, Laural Merlington is an excellent reader, does all the voices well and her italian accent and speech makes this one of the best audio books I have every listened. Worth every penny. A great escape writer. I enjoyed the story and the performance. 5 Star because it was a story that kept my interest and had a good ending. Sometimes that's all I want and this book delivered just that. I am a NR fan. This was a complicated plot. I had some problems figuring out the characters but that is just a problem of "listening". Intriquing plot from my perspective. I loved everything about this book. This is a great vacation read. I loved this book! The characters were great, as well as the story line and the narrator. I didn't want it to end. I will listen too it again. I'm not a huge Nora Roberts fan but I really enjoyed this book!